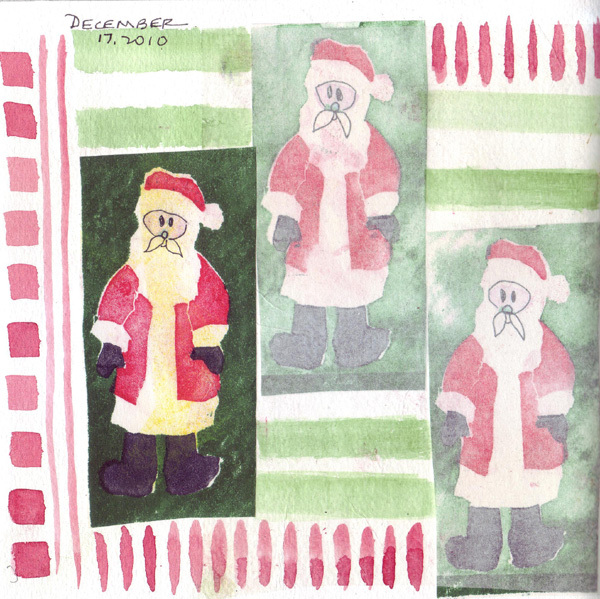 I made a fun foam Santa stamp from a drawing that I posted earlier - and used it to stamp on the front of a sketchbook. 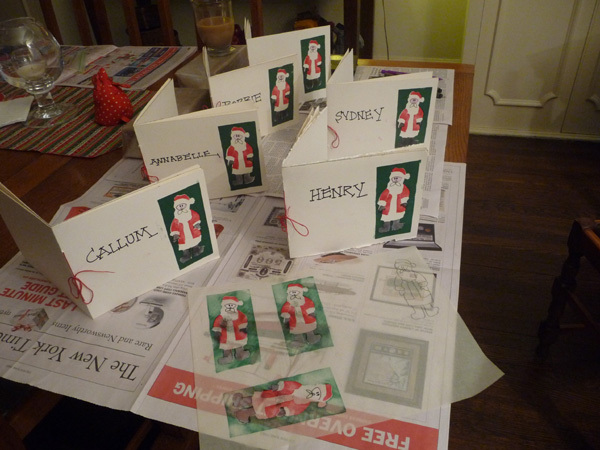 I then stamped the envelope of a Christmas card and a piece of newspaper to clean the ink from the stamp parts. 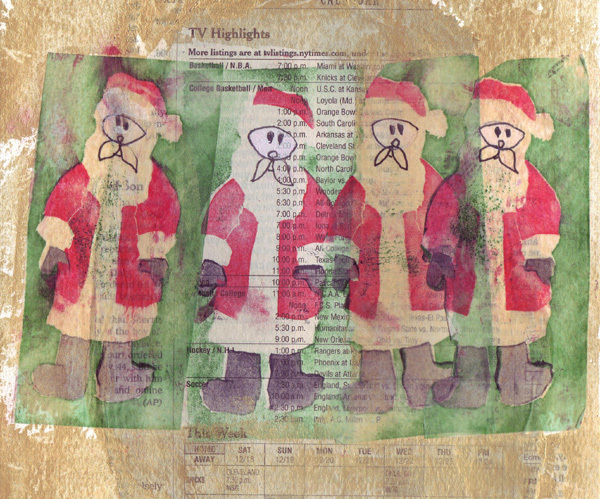 The following day I stamped the front cover of 6 pamphlet stitched sketchbooks for my Grandchildrens' Christmas stockings and stamped 3 more Santas on tracing paper to clean the stamps. Happy Holidays to everyone! And a fabulously successful, art-filled New Year. 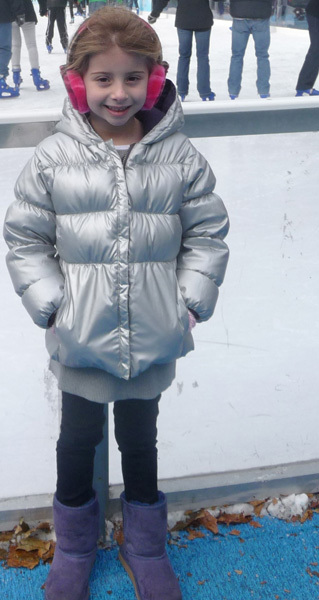 Sydney will turn 6 on Monday and her younger brother Callum will turn 4 on Sunday. Celebrating Hannukah, Birthdays, and Christmas all within a few weeks is too much for them, so I took Sydney for a "Birthday in June" art supply shopping trip the last two years and will see what special presents/adventure Callum will want this summer, instead of now. 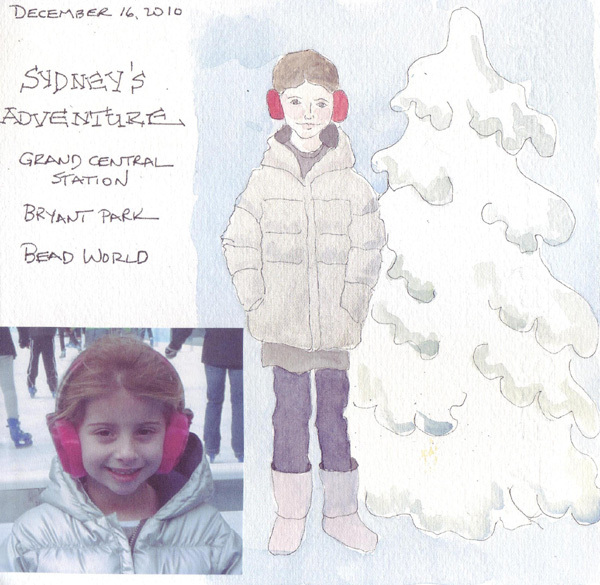 This year I also decided that Syd and I needed a special day for her birthday and yesterday I picked her up from school after an early morning dismissal and we headed to midtown to Grand Central Station and Bryant Park - to see their Christmas Villages (crafts booths), watch the ice skaters, photograph the Christmas trees, and take a carousel ride. Then we headed to Bead World - our real destination - and she picked out 10 special beads for us to put together for a "fob" for her school backpack. Her hat wasn't keeping her ears warm so we decided that she needed a pair of earmuffs like I was wearing. Here she is happily showing off her new pink earmuffs! And my sketch of her in my visual journal to remember this happy occasion. Regular readers of my blog will know that I only sketch and paint my grandchildren from the back - this may be a new beginning.... I painted her silver jacket with WN silver gouache which looks great on the page, but doesn't scan as a metallic. 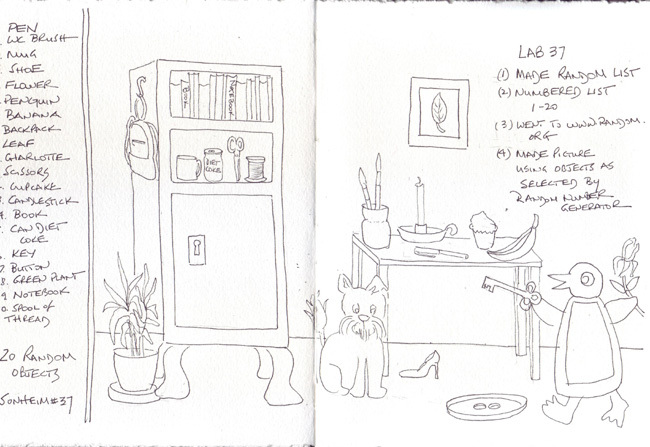 I still sketch from Carla Sonheim's book Drawing Lab, and hope to finish all 52 exercises by the end of Winter. I periodically post some of my 100 Faces (Lab 16), but have only completed 36/100. I have a zipper pouch with cards cut from watercolor paper, pencil, pen, eraser, 8 watercolor pencils, and a watercolor brush that I carry with me when I know I might have a chance for a live Face Drawing. I'll post a picture of my great pouch with the next batch of faces. Lab 35: Browse a magazine and rip out a few pages that speak to you. Then collage one or more elements to a page and add a sketch around the collages. 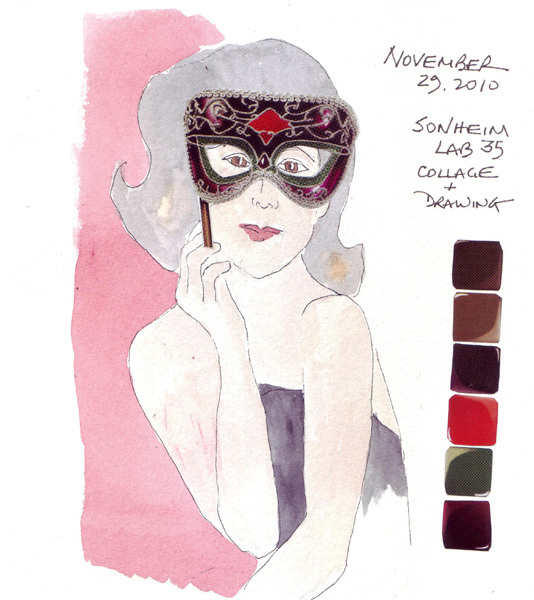 I picked up the Sunday NY Times magazine and found this mask/color samples, and didn't want to look for anything else. It spoke to me! Lab 37 Instructions for this lab are as follows: Quickly make a list of 20 things. Using a random number generator (she provides the URL for one on the web), draw each item in the order that they are "selected" as a random number. My list of 20 items is on the left side of the spread. This was great fun and another one of her terrific methods for making original drawings. 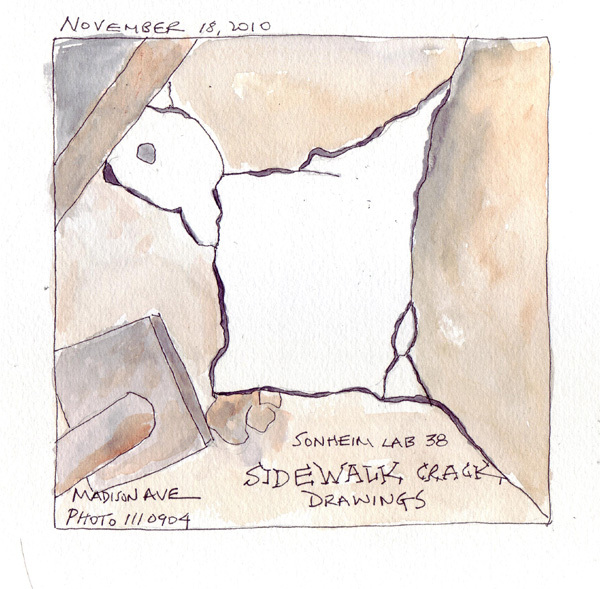 I photographed sidewalk cracks for several months while walking around New York City. When I finally got to this Lab, I selected a photo, rotated the image on the computer, and finally saw a little lamb. I should have left out the curb edge (upper left corner) and the bottom of a scaffold support (bottom left corner) - but I hope you can see my lamb anyway. Katherine Tyrrell, on her blog Making a Mark, posts monthly data re: art book ratings and sales. I'm not surprised that Drawing Lab remains tops in sales for Drawing Books. It is a great book if you want to loosen up and have fun - especially with a group. I volunteer for Goddard Riverside, a settlement house on the Upper Westside of New York, sorting new books donated by publishers each Fall and then working at the annual Book Fair where the books are sold for 50% or less. 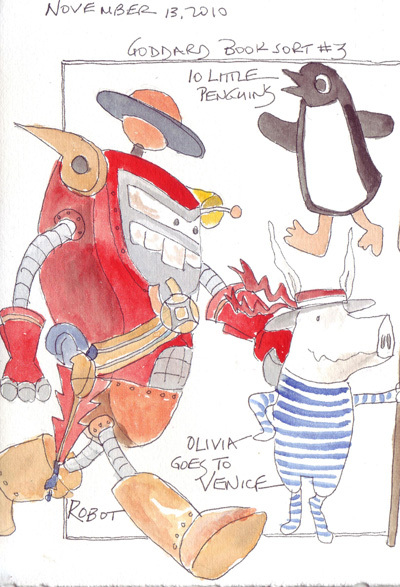 This page was created by sketching the main characters of 3 books that I bought for our grandchildren. We take our oldest Grandson to 4 NY Philharmonic Young Peoples' Concerts each year and he gets to try instruments in the Kidzone, which is held the hour before the concert. Last Saturday was a concert on Baroque music and he was able to try the harpsichord, and play a violin (which he does anyway.) 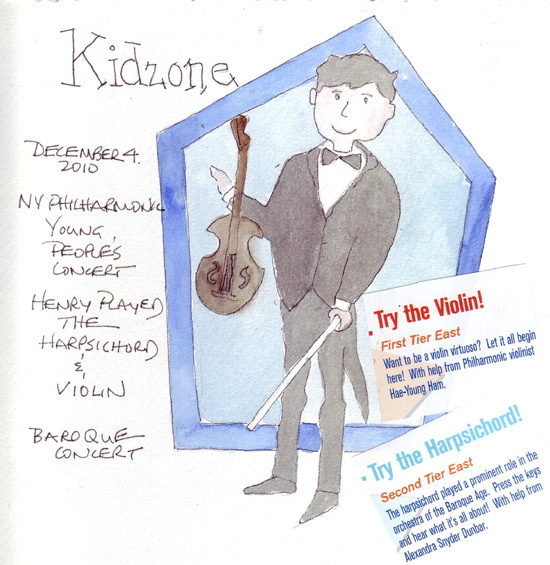 The violinist picture on this page is the image from the Kidzone violin site in Avery Fisher Hall. 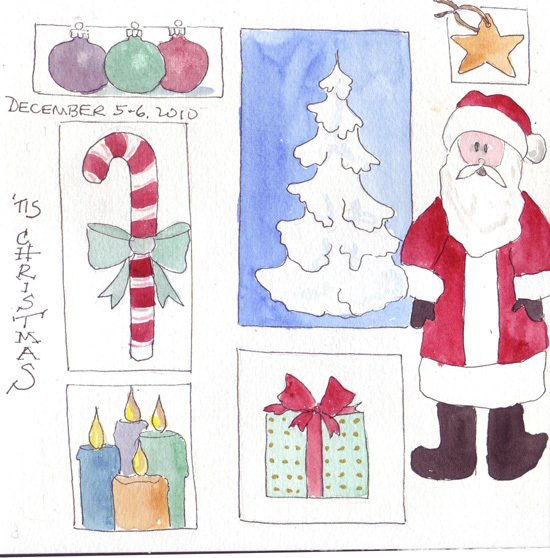 I spent last weekend planning and making some Christmas gifts for the children and decided to draw a grid page, in case I want to make some fun foam stamps for the season. 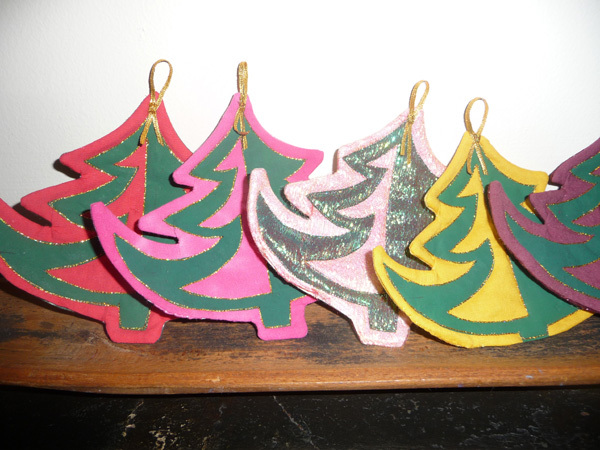 I make multiple Christmas ornaments each year and just finished those for 2010. 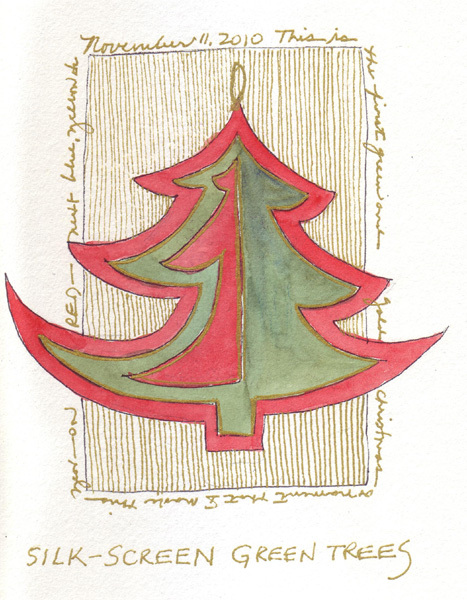 Several years ago I made many images of a Christmas tree in a silk screen workshop by Marit Kucera and just put away the fabric squares in my studio when I came home. 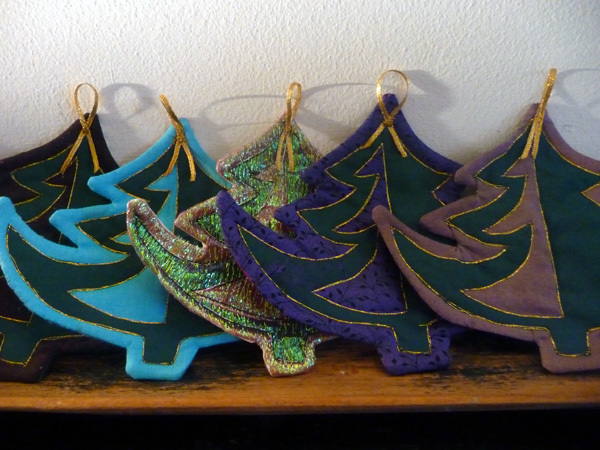 This year I rediscovered them in my studio and designed ornaments for our children and grandchildren to hang on their trees. I made 13 total, several with a sparkly fabric overlayer. After stitching together the fabric with the silk screen, batting, and backing, the trees were turned and machine quilted with gold metallic thread (YLI Kaleidoscope). I love the sparkle!